Following Saturday’s game against the Diamondbacks, the Nationals have 66 games left in the regular season. Assuming no funny business with the schedule (skipped starts, rainouts, etc) the Nationals could send out the #5 starting pitcher 14 more times this season. Let’s be as pessimistic as possible (if Twitter is any indicator, this will be very difficult for Nats fans to do) and assume that the Nationals send Jeremy Guthrie out every fifth day to get pounded over and over again a la Tom Cruise in Edge of Tomorrow. In other words, chalk up 14 losses. If the Nationals continue to play at their current 0.613 winning rate over the other 51 games, they would then end up with a 88-74 record on the season. 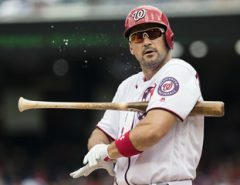 Of course, the Nationals might not be able to sustain such a torrid pace, so let’s tone down the optimism. FanGraphs projects the Nats to have a 0.557 winning percentage from here on out, which would leave our fictional, Jeremy Guthrie led squad with a 85-77 record. With no other team in the NL East projected to top even 80 wins on the season, either outcome would get the Nationals into the playoffs with room to spare. Regardless of how the #5 starter performs from here on out, it would take a collapse of epic proportions for the team to miss the playoffs. Someone has to make those approximately 14 starts, though, and thankfully Guthrie isn’t walking through the clubhouse door anytime soon. 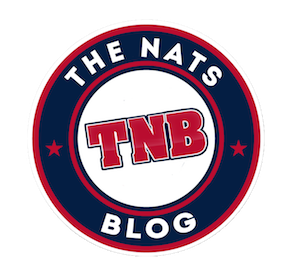 In the interim, the Nationals have the bodies to fill those starts. It might have been only one start, but old friend Edwin Jackson looked competent on Tuesday, throwing 7 innings of two-run ball while hitting 95 on the radar gun. Youngsters Erick Fedde and Austin Voth have had up and down seasons in the minors, but a cup of coffee in the bigs would probably be beneficial for their development. Assuming Jacob Turner doesn’t develop vertigo from his recent call up/send down/call up/send down yo-yoing, he too is capable of eating some innings as a starter. Once the playoffs roll around, the fifth starter is relegated to bullpen duty if not left off the playoff roster entirely, so there is no need to find a an arm ready for the spotlight of October baseball. By not making a move, the Nationals will have to be comfortable handing the ball to Tanner Roark in a playoff game in a couple of months. Roark hasn’t been nearly as sharp in 2017 as he was in 2016, but he has shown flashes of his old self. On top of that, by focusing resources on rebuilding a deep bullpen rather than the rotation, Rizzo can limit the number of innings Roark would have to throw in a hypothetical playoff situation. Don’t forget that the Indians were an out away from bullpenning their way to a World Series title last year after giving significant playoff innings to Trevor Bauer, Trevor Bauer’s drone and Josh Tomlin. 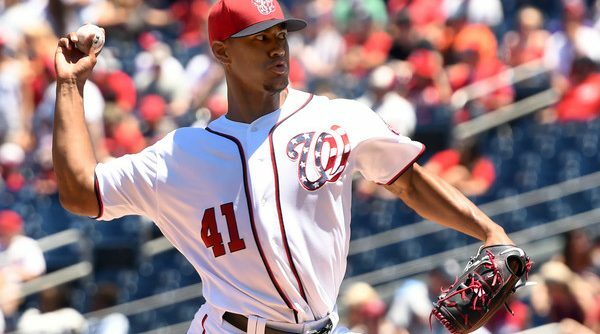 Of course, Joe Ross’ recovery from TJ surgery will likely keep him from the mound for the entirety of the 2018 season as well, leaving a longer term problem that the Nationals have to solve. That seems like a valid argument for trading for a starting pitcher on a long term contract that could help in 2017 and beyond. Except trading for a player like that right now would be buying at the peak of the market. The majority of teams in the playoff hunt are searching for starting pitching reinforcements right now, the Yankees, and their deep pockets, at the forefront. If Michael Fulmer truly is available, for example, the Nationals will be far from the only team looking to buy. Instead, Rizzo could look to swing a deal for a starter in the offseason when demand isn’t as high or go fishing in the free agent pool that, while it doesn’t have a lot of star power, is filled with plenty back of the rotation types. In a perfect world, it would be lovely to bring in reinforcements for the rotation. But it’s not a perfect world and the cost of upgrading the rotation is just too high to make it a worthwhile endeavor. The Nationals won’t need a new starting pitcher to make the playoffs and, if Rizzo can continue to build out a new bullpen, they won’t need a new starting pitcher in the playoffs either.